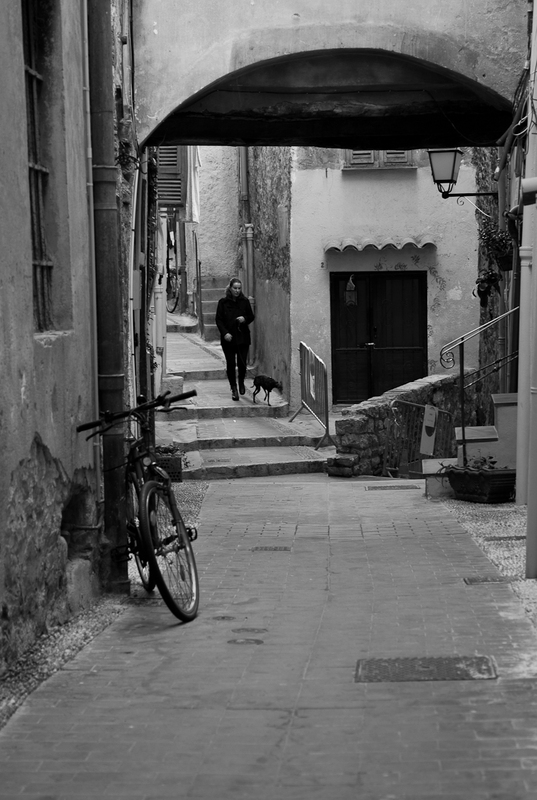 It's Christmas Eve and a lady walks her dog in the medieval streets of the Old Town. It's easy to let the mind blur and imagine another lady - centuries ago - long dress, dirt on the hem, as she walks to the market on Place aux Herbes. These old streets breathe history. C'est la veille de Noël et une dame promène son chien dans les rues médiévales de la Vieille Ville. - en robe longue, de la saleté sur l'ourlet tandis qu' elle se promène au marché de la Place aux Herbes. Ces vieilles rues respirent l'histoire. Yes, and thanks for sending out this breath of history. Street candids say so much... a sense of wonder revealed. and to walk those streets is to move backward and forward through time. beautiful. I love the old street scenes; thanks for sharing. Well said, Jilly. And I know what brattcat means. One can lose one's self in time, however briefly, in such streets. It must be amazing to walk on ancient stones every day.